Attorney-turned-artist Alyson Thomas's playful graphics on these vodka tonic glasses means that the formula for the effervescent favorite is always at hand. Her hand-drawn, graphic representation of the classic cooler adorns the functional highball glasses with a playfully pseudo-scientific rendering of the drink's essential components: vodka, tonic, frosty ice cubes, and a lime wedge, all in relative proportions to mix a perfect cocktail with intuitive flair. Glassware made in New Jersey. Decorated in Edina, Minnesota. Check out Alyson Thomas's other Cocktail Diagram Glasses: Gin and Tonic Diagram Glassware, Martini Diagram Glassware, Margarita Diagram Glassware, Sctoch & Soda Diagram Glassware, Mojito Diagram Glassware, Mimosa Diagram Glassware, and Hot Toddy Diagram Glassware. LOVE these glasses! They are so fun with the ingredient markings. We use them mostly as juice glasses as they are the perfect size (and I don't drink gin and tonics!). They are not full size glasses so good for any lesser amount of liquid you want. Dishwasher safe. Highly recommend them!! How can you not enjoy making a perfect cocktail every time when you use these glasses? They are fun, stylish, and the absolutely perfect size. I could not ask for better. These glasses are great, they look fun, and the recipe is fantastic and makes it so you can just eyeball your drink amounts! Loved them enough that we bought a second set just to have a backup! I would most certainly purchase these glasses again ! These glasses are a gift. Love it. Supet cute and seems to be strong glass. Going to be the star of a vodka tonic gift basket! The perfect gift for my bibulous aunt! These glasses made a terrific gift. I am going to order some more for myself. 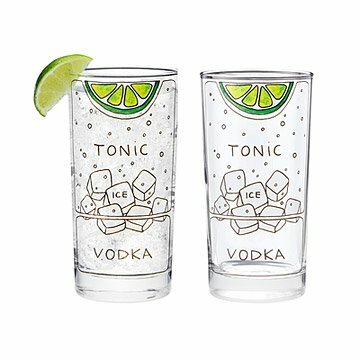 These glasses are cute and have the measurements to make a perfect Vidka Tonic! A great gift idea for anyone who likes this drink! Add a bottle of vodka and you have the perfect gift! These vodka tonic highball glasses are printed with an original diagram depicting the classic cocktail.